Jeff Bezos recently became the first centibillionaire on Forbes’ list of the wealthiest people in the world, with $141.3 billion to his name. For Bezos, whose valuation is 95% Amazon stock alone, his capital and image are intrinsically tied to his brand. When Bezos succeeds, Amazon succeeds — and does Amazon ever succeed. Some experts point to the success of online megastores like Amazon for the recent brick-and-mortar retail decline. They claim that last year’s record closure of more than 6,700 storefronts was in response to the to the lower prices, accessibility, and predatory practices of online sellers. On the other hand, an analyst for Forrester Research, say that’s simply not the case. Pointing to a statistic from the US Census Bureau, online business sales only account for 10% of all retail. That means most shoppers still want to visit stores in person. So where’s the disconnect? Brand consistency begins with a long, hard look in the mirror– which requires quality data about your internal processes and trends over time. While even “analog” businesses use a POS system or an electronic database for tracking inventory and timesheets, they need a way to track individual store performance. There are a wealth of apps and tech gadgets storming the online marketplace that look to soothe brand compliance woes. Take Form.com, a pioneer in internal audit software, which was recently adopted by the Wendy’s brand of quick service restaurants for their inspection and auditing process. Their mobile platform gives users the ability to document, communicate and correct issues all from one easy-to-understand interface. More importantly, it takes the guesswork out of workflow management for top-level supervisors. With a tool like this, managers can ensure that employees are appropriately trained to handle customer concerns, and they can empower and educate their staff to make the right decisions using contextual data and on-the-spot coaching prompted by the app’s feedback. Brick-and-mortar brands can start by taking a page from Amazon’s playbook. It’s time they think of their brand as a tool to nurture relationships and build confidence rather than a justification for a hefty price tag. Ask yourself: when is the last time you walked into a department store just to browse — and had fun? Now, think about how many folks spend hours a week clicking through Amazon product pages, suggestions, and reviews simply to pass the time. What makes the Amazon experience so “fun,” though? It’s not just the convenience of lounging on your couch without a single sales clerk to pester you — though, that’s probably part of it. According to a publication from SalesForce last year, 55% of shoppers say retail experiences are generally “disconnected” from channel to channel. To boot, 63% of shoppers don’t feel like retailers really know them. Amazon’s approach is successful because more than 70% of customers are more likely to spend money with a brand that recognizes them by name, recommends options based on past purchases, or knows their purchase history. 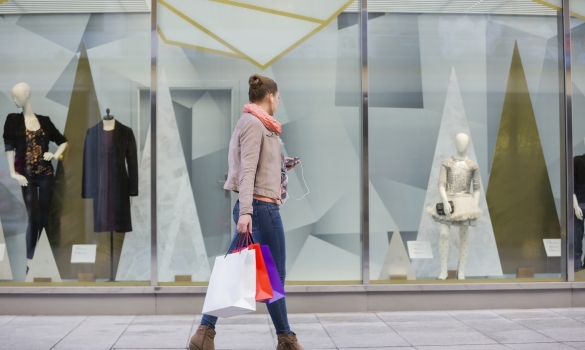 The typical storefront hasn’t evolved to meet those new standards. Traditional retailers and big-box stores will eventually need to open their doors to the “just looking” crowd not just as another way to drive foot traffic but as a primary occupation. Brick-and-mortar brands have to offer attractions to bring back one-time customers. In a way, retailer stores of tomorrow will mimic the Software-as-a-Service model, wherein clients will pay just to enjoy the brand and its accoutrements rather than an actual product. That doesn’t mean the Apple Genius Bar will turn into an actual bar complete with cover charge and a floor show, but some retailers have done something pretty close. Featuring restaurants, pop-up shops, and rooftop bars, the latest cutting-edge storefronts are pushing the boundaries of what a shopping trip can entail. Pop-up stores have increasingly become an actionable strategy for retailers to debut a new line of products or branch out into new genres and industries. American customers especially enjoy the unique services and products showcased at pop-up stores, and many pop-up visitors described it as a fun experience. Apart from buying books, consumer electronics, and office supplies, retail trends indicate most shoppers prefer going to a physical store. In-store retail isn’t going anywhere. But you should be on your toes: only retailers who strive to evolve and develop long-term brand strategies will survive the rise of the digital marketplace. The next time you double down on an unpopular policy or turn down an offer to develop a mobile app, think: are you protecting your brand, or bailing water from a sinking ship?